The weekend turned out to be a busier one than I had anticipated, and not because I was Christmas shopping. No, I was on a far nobler mission, the mission of good beer. Friday night I managed to drag my still-sick-with-a-head-cold-can’t-taste-much husband up to NE to check out the newest Fire on the Mountain outpost. I’m a serious addict of their wings, and didn’t anticipate this would change that, but the one, two punch of offering both house brewed beer AND pizza was too much to pass up. 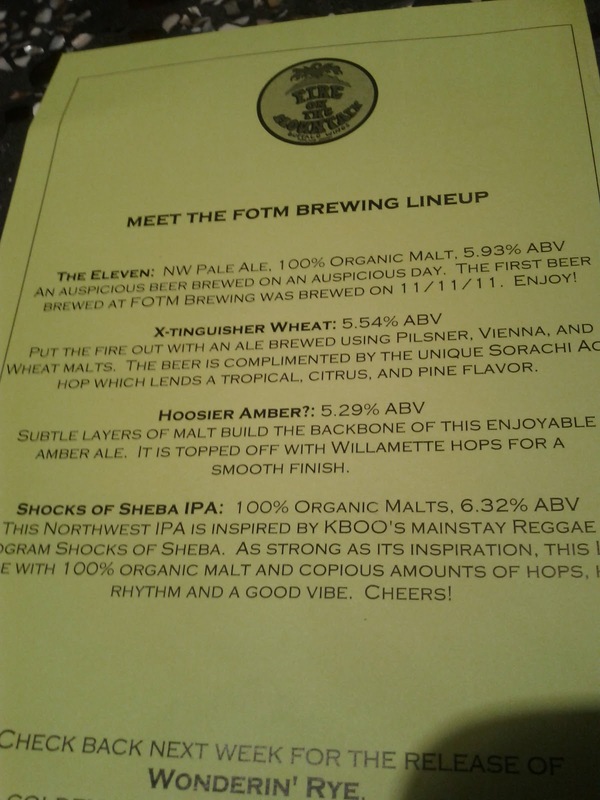 They are currently offering four beers, The Eleven NW Pale Ale, which I had tried a few days earlier at the Burnside location, X-Tinguisher Wheat, Hoosier Amber and Shocks of Sheba IPA. It will come as no surprise to hear that I liked their IPA the best. Part of it may be that I’m a hop head and pitted against three less hoppy beers, the outcome was nearly assured. Part of it may have been that those other three beers were simply styles that generally don’t impress me. I’ll leave any further speculation up to you. Saturday night I got beer geeky at Brian’s place, where he dipped into his cellar and fellow beer lovers brought delights to share. 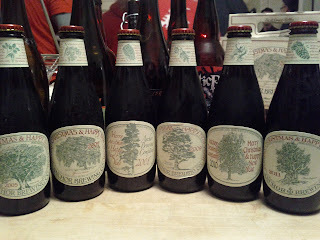 One of the highlights was a vertical tasting of Anchor Christmas Ale, a beer which has never screamed out to me. 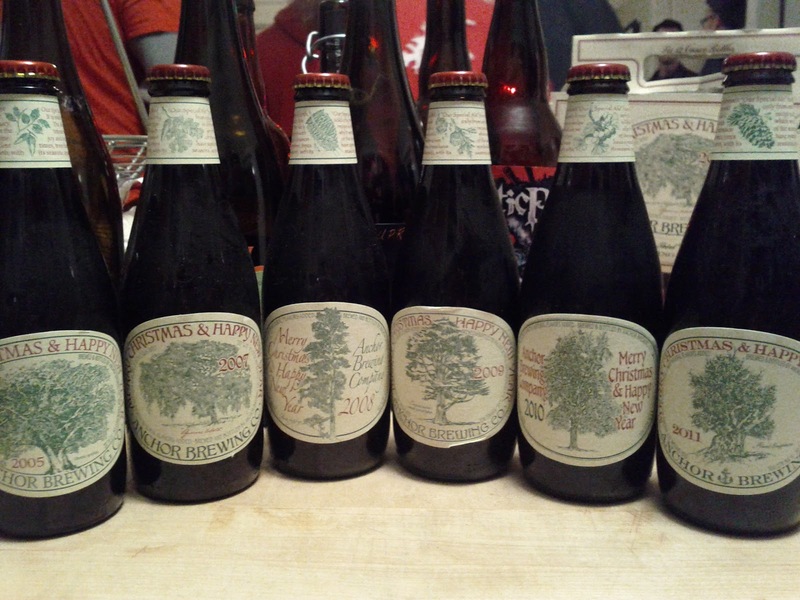 While I still won’t be going to any lengths to acquire my own, the vertical tasting was very interesting. The 2005 was my favorite (and upon closer inspection, the only bottle with a screw-off cap), the 2007 & 2008 similar to one another, the 2009 & 2010 also similar to one another but a departure from the previous two and the 2011 nothing to write home about (maybe it needs a couple years in the cellar). There was also a magnum of Our Barrel Ale, which was a delicious blend of beers. Three other beers of note from the night were Breakside Brewery Soursop Wheat, New EnglandBrewing Company Imperial Stout Trooper and Three Floyds Brewing Arctic Panzer Wolf. These three probably couldn’t have been more different, ranging from a delightfully, light sour beer, to a chocolate, roasty imperial stout to a huge hop bomb. 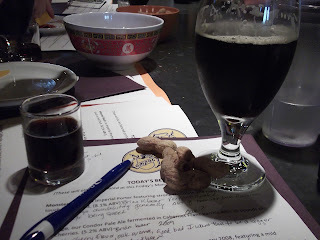 Sunday afternoon I had my second chance to get beer geeky at The Beermongers’ Cellar Dip. Sean brought out some treats, as did the other beer geeks that showed up. There weren’t any verticals but the vast majority of beers were ones that were not possible to get here. Some were personally brought back, others had been sent by friends and others came as the result of trades. Three Floyds once again came in my top three, this time with their 2009 Behemoth Blonde Barleywine, along with the now closed Roots Organic Brewing Epic Ale and HoppinFrog Brewery Barrel Aged Naked Evil Belgianesque Barleywine. It was a busy weekend for this beer geek. Thanks to everyone that helped make it such a good time. I’ve never brewed commercially. In fact, I’ve never brewed anything larger than what our standard-sized home brewing set up can handle. And even though that equipment made the cut on what to keep and what to get rid of when we moved to Portland, we haven’t used it since well before the move. Sunday I had the opportunity to help brew, this time in a real brewery, albeit on a small system. The Saturday prior I had attended a Pink Boots Society meeting where there were a number of LOLA members and other ladies from the local brewing scene. 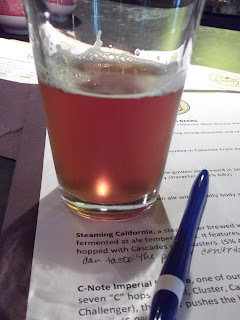 One of the things discussed was what type of brew would be made the following week and in the end the decision was made to go with a chocolate raspberry porter. 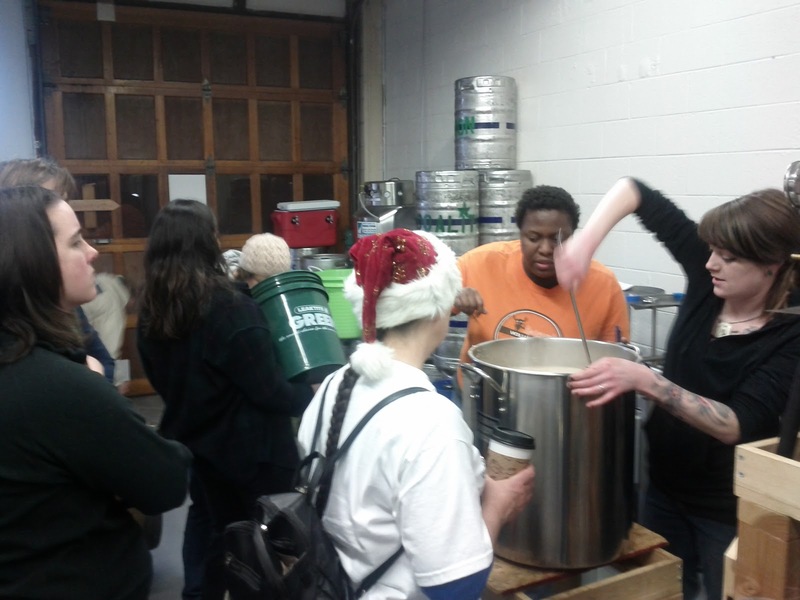 Besides being a collaborative brew, brewed on the equipment Coalition uses for its Coalator program, the final product is destined to be part of The New School Beer Blog’s New Year’s Eve party. The bash will be held at Burnside Brewing and proceeds will benefit local charities. 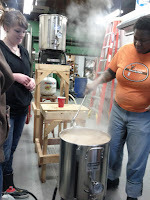 Although I wasn’t able to stay the entire time I did get to sample the fresh, hot wort. It was darn tasty, like real maple syrup, although not quite as sweet. The raspberry puree was added near the end of the boil and I look forward to trying it in a couple weeks when it’s ready to be kegged. 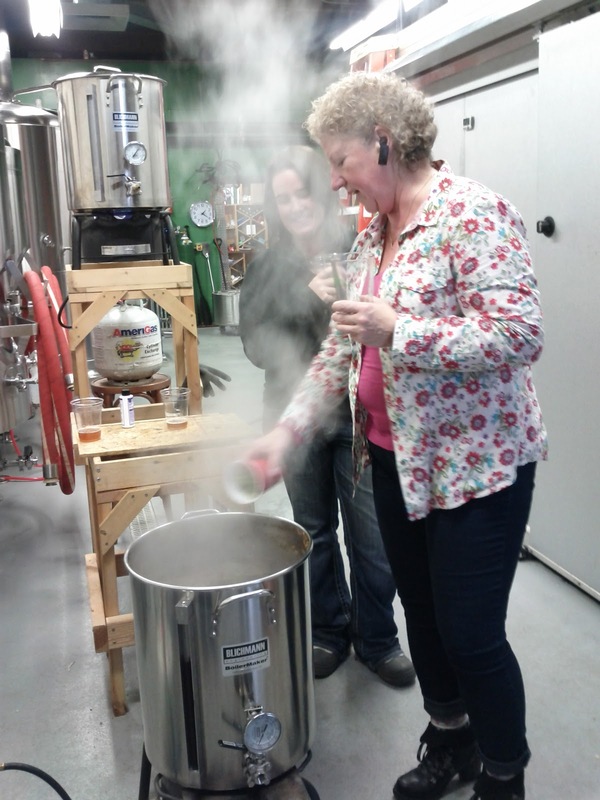 Thank you to Coalition for the use of the space and equipment, Great Western Malting for the malt, to Lee for heading up the brewing and to all the great ladies for a few fun hours brewing. Like many young adults who are put their childhood on the shelf, reach toward adult status and vary their name to something they feel is more reflective of the person they are trying to be, Beetje Brewery has become The Commons Brewery. 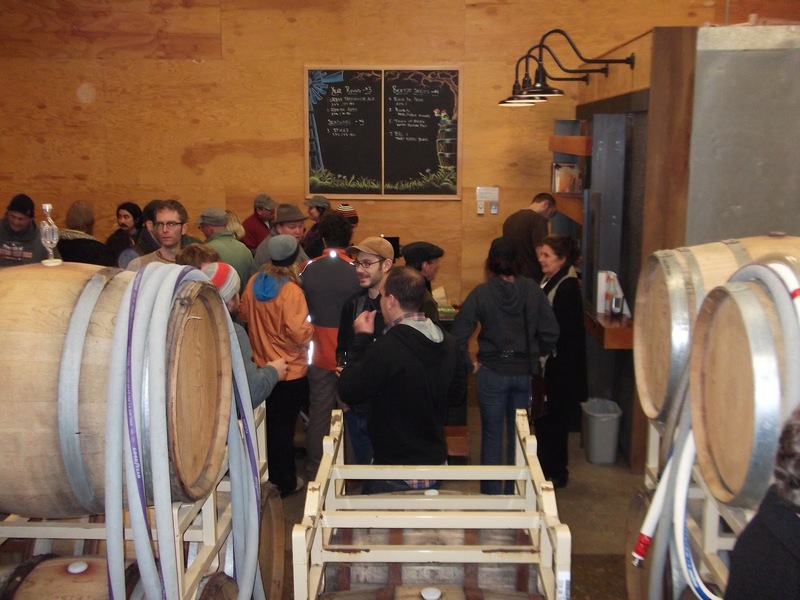 They’ve upgraded their accommodations from what was surely becoming a very crowded garage with a 1bbl system to a shiny, yet unpretentious, space with a 7bbl system in SE Portland. 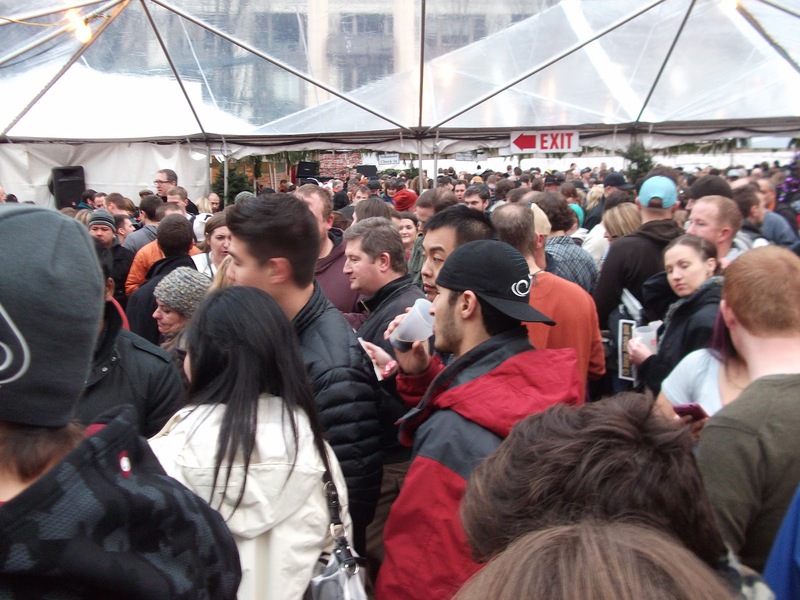 Saturday marked their official opening to the public and it was exactly what I needed, having come from the far-too-crowded-for-me environs of the second to last day of the Holiday Ale Fest. This, this is the kind of place I expected to, and did, see many of my fellow beer geeks. In the course of chatting we made it through a sampling of the seven beers available: Urban Farmhouse Ale and Flemish Kiss from their year round selection, Sticke, a seasonal, and four in the Beetje Series, Fleur de Ferme, Rooibos, Touch of Essex and BBL 1. My favorite of the group, no surprise, was BBL 1, a tart barrel blend. I was one of their followers who was sad to see the Beetje name officially change, but they’ll always be Beetje to me. Just like I’ll always be known as “Krissy” to a handful of people who are very dear to me. For those interested in checking it out in person, the tasting room is open Fridays 5:00 – 9:00 pm and Saturdays 4:00 – 9:00 pm. Cash and credit card accepted, minors politely declined. 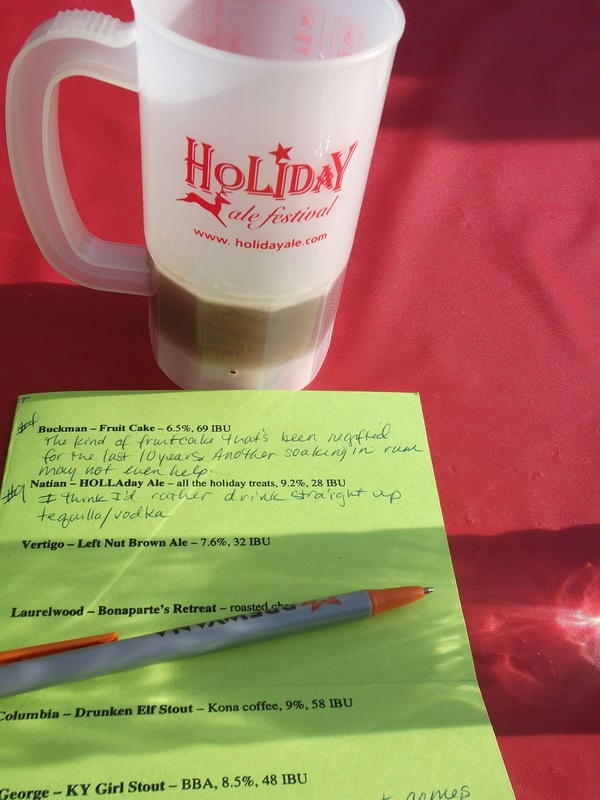 After a five-day run, this year’s Holiday Ale Festival is now just a memory and it’s time for a little reflection. Overall I found the offerings to be a bit weaker than last year or maybe it was that while there were some really outstanding beers, there were some very disappointing beers, something I don’t recall from last year. Firestone Walker Velvet Merkin – Yes, I’m hopping on the bandwagon and giving this beer two thumbs up. Laht Neppur Laughing Boy Stout – This was my second beer of the festival and I was pleased to find it a very well done bourbon barrel aged Russian Imperial Stout. MacTarnahan’s Barrel Aged Ink Blot Baltic Porter – This beer was on my “skip” list simply because it was from MacTarnahan’s. I was wrong, so very wrong, and I'm super pleased I had the chance to try it. Stone Ruination IPA DDH Apollo/American – Besides being completely different from most of the beers at the fest, it hit the right notes for me being packed with hoppy grapefruit flavor, very smooth and immensely drinkable. Upright Provision – While I like some Upright beers and dislike others, this one fell solidly in the disappointment category. My sixth beer of the fest, I don’t think my taste buds were that far gone but I got nothing, just nothing from this beer. Brew Crew Hallucinator – One of my main reasons for trying it was that it was billed as a Holiday Ale Fest only beer. Lesson: that doesn’t mean it will be good. Buckman Fruit Cake – Fruit cake has a bad reputation, sometimes undeserved, sometimes rightfully deserved. This proved to be the latter. 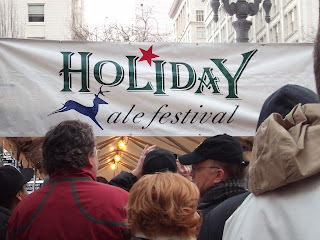 Natian HOLLAday Ale – In general I’m a Natian fan (especially after meeting Nat recently) and I was excited to try all of the holiday treats in one glass. I guess sometimes there is such thing as too much of a good thing. Beyond the beers there were a couple things I hope the festival organizers will take note of and improve upon in the future. 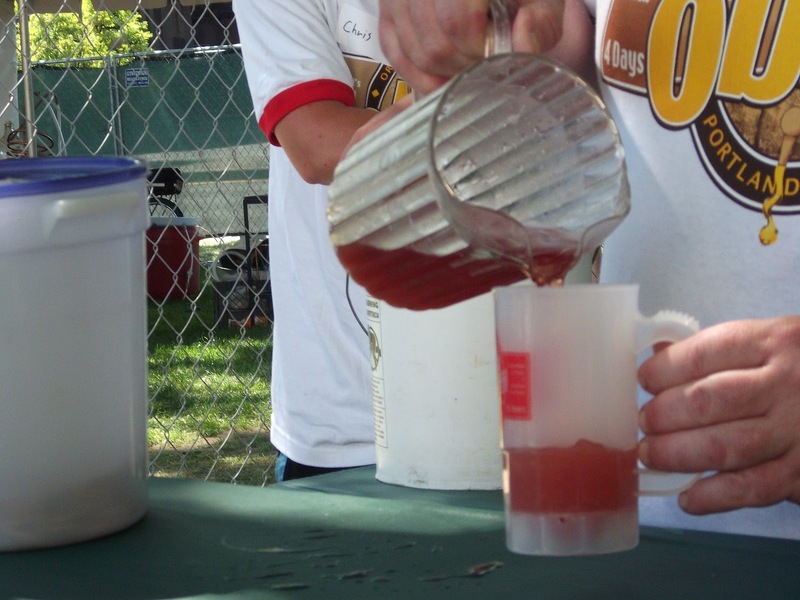 Water Stations: Water, for rinsing and for drinking, is essential at any beer fest. When a fest bars outside food and beverage from being brought in, it’s particularly essential that there are plenty of well stocked water stations available. Besides the hydration factor, it’s impossible to get the true taste of a beer if the last one is still lingering in your glass. One water station near the exit for a multi-level event doesn’t cut it. Re-entry: Both this year and last year we went to the festival multiple days. Last year there was no issue with coming back, as long as it was the current year’s festival mug in your hand, all you had to do was get ID checked again and buy more tasting tickets. This year however, I feel we came very close to having to pay for a whole new package ($25 for a mug and 8 tasting tickets) because our stamps had worn off and we had taken our wristbands off. 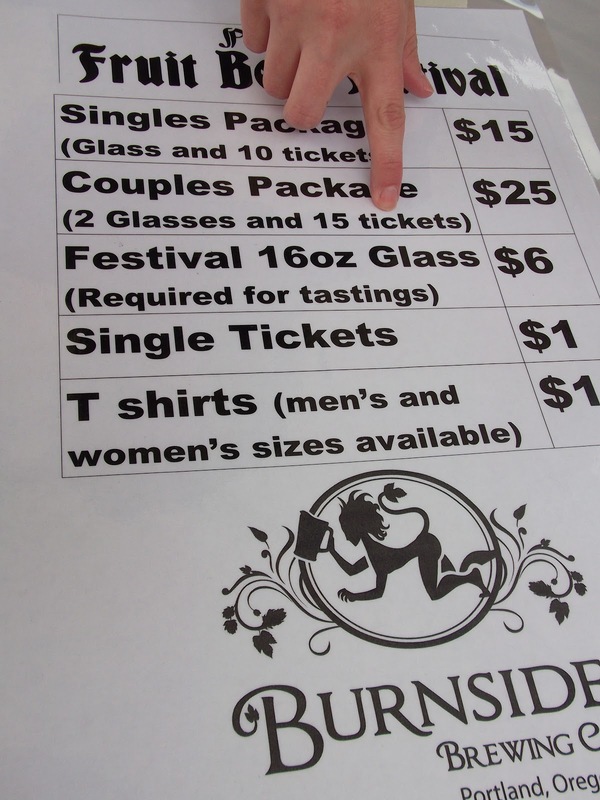 I understand that the festival doesn’t want one person buying a glass and then letting buddies use it. But what the festival didn’t seem to understand is that I, and probably a good majority of attendees have jobs, professional jobs, where wearing a bright red “ID checked” wristband and not showering in order for the stamp to stay on is simply not acceptable. While I may complain about some of the beers, you won't find me dwelling on them. In fact, if you ask me in a couple months which beers those were I will likely have to pull up this post to remember. And for the critiques of the water and re-entry issues, well, I'm an event planner and I can find things that need to be improved upon at nearly any event. So no hard feelings, friends. You win some, you lose some. 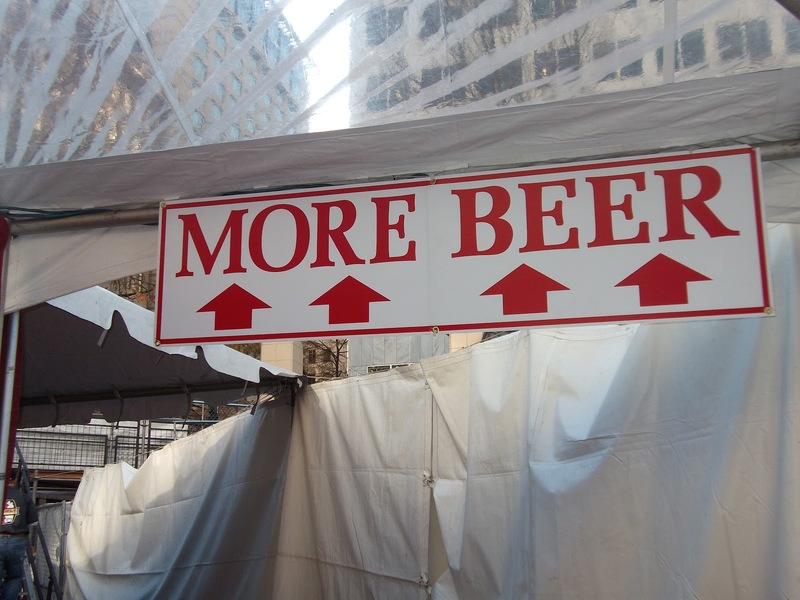 And there will always be more beer to enjoy. Another year is nearly in the books, but before we say good-bye to 2011, it’s time to say hello to the five day winter festival of goodness known as the Holiday Ale Festival which is celebrating 16 years of giving Portland beer geeks something to look forward to between Thanksgiving and Christmas. As with any beer fest, and especially larger ones like this, I can’t go in unprepared. 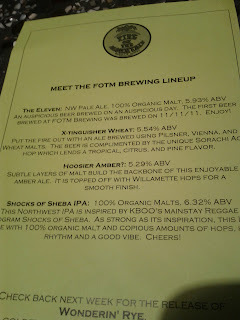 Besides the anticipation and drooling as I read over the descriptions of the beers, I need to identify (before I arrive and get overwhelmed by wanting that one and that one and that one) which ones I really want to try. There are usually a few I’ll be seeking out to make sure I have while I’m still fresh and my taste buds are intact and there are usually a few that I won’t be upset if I don’t have. The rest fall somewhere in between. To keep me on course, I’ve developed my handy, dandy Beer Geek Cheat Sheet*. Through trial and error I’ve found what works for me and when printed on nice 8.5 x 11 card stock, it's the perfect size and I don’t even need to find a table to do my scribbling. Although there's no rocket science to it and utlitarian is the best way to describe it, I've gotten compliments on it in the past. So if you want to check it out (and modify it for your own use) here's the front and back. *Disclaimer: My Beer Geek Cheat Sheet categories (skip, front page, back page) are based on personal preference only and reflect my understanding that it is highly unlikely I’ll get through every beer, even on multiple visits. Therefore, sacrifices must be made. No slight is intended toward any brewery or beer. Heck, I just might end up with a “skip” beer in my glass and decide to decide to build a shrine to it because it has completely blown my mind with its amazingness. Happy Cyber Monday! Did everyone enjoy their Thanksgiving? I know I enjoyed eating what was surely a year’s allotment of turkey, stuffing, potatoes and dessert. Oh, yes, and of course there was beer. In my last post you’ll recall my lamenting of this year’s Thanksgiving destination, Dallas, as one of the virtual wastelands of good beer. I’m happy to report that things turned out much better than I anticipated. Since our family actually did The Big Meal on Friday, I headed out in search of beer on Thursday. I figured there wouldn’t be any problem finding open liquor stores but after my first stop on liquor store row I started to get concerned. It, along with the rest of the roads I had traveled, resembled the post apocalypse (less the roaming bands of zombies). After making it to the end of the row and turning around, I spied one more place boasting a neon OPEN sign. Walking in I was a little disturbed as all of the patrons appeared to have been past their prime, not too far removed from rotting flesh zombies. (That may be a little extreme but these were not the folks stopping in for something to bring as a contribution to a lively Thanksgiving dinner.) But as I hooked a right and took in the beer coolers, the skies opened and the birds began to sing. There were many readily recognizable beers, and not just the “will do” variety. In fact, there were so many choices I had to reign myself in and remember that I would be flying out in less than 48 hours. BrooklynBrewery Local 2 (bomber) – While I’ve heard of Brooklyn, I’m not sure I’ve had any of their brews nor am I sure if it’s distributed on the West Coast. Described as a bottle conditioned Belgian Strong Dark Ale brewed with honey and spices, I was intrigued even if I wasn’t sure I would like it. As it turned out, it wasn’t too bad, not something I’d buy again, but something I’d recommend to others who like the style. Ska Brewing Modus Hoperandi (6 pack – cans) – This was my concession to buying something that I already knew I liked. I’d had it at The Guild’s Can Fest over the summer and in addition to a great label, it’s a hop-packed brew. Yum! Harpoon Brewery Leviathan Series Imperial IPA (4 pack) – Another brewery/beer I hadn’t had and didn’t think I’d be able to find back in Portland. The beer was packing heat at 10% ABV and may have been more than I needed, I couldn’t say no, it was a holiday after all. It was a bit boozy but well balanced overall and I think that the remaining two bottles in my grandmother’s fridge will age better than the two bottles (a brown and a pale) I found from my last visit (at least 1 ½ years ago). Were there any Thanksgiving beer winners on your table? Thanksgiving is a great holiday. There is no other purpose than to indulge in the type of gluttony I work to resist and then to sit, nearly immobile, to watch football. This year the plus of getting to spend hours in the kitchen cooking for many more people than I usually have the opportunity to is balanced by: 1) the clusterf*%$ that will be traveling to and from Dallas 2) the lack of a charcoal-grilled bird (the oven will have to suffice) and 3) the general lack of good beer in Dallas. I know you could give a hoot about #1 and #2. You may have your own travel woes and weren’t brought up by a dad who faithfully braved Iowa winters to cook a 20-pound bird on the Weber grill every Thanksgiving and Christmas. But #3, I’m sure you can feel my pain on that one. It’s particularly hard, coming from Beervana, to know I’ll be in a virtual wasteland of beer worth drinking. And it doesn’t help that Dallas proper, where I’ll be, is still dry. Yes, dry. So I’ll travel just outside the technical city limits, at which point there will be at least one liquor store every block for…well…a while. However, even when I get there the most appealing options will likely be offerings from larger craft breweries, nothing I haven’t had before. I’ve actually considered shipping myself some beer (since I trust those companies far more than the airlines to deliver my precious cargo, if I were to actually check a bag). So far I haven’t done it since I’m not usually gone that long and more importantly, why give the family any more of a reason to think I’m a little too obsessed with beer, right? I hope whatever your Thanksgiving plans are, they are filled with people you enjoy, delicious food and of course, beer befitting your celebration. And if you have ever shipped yourself beer, let me know so I feel like a little less of an alkie for thinking about it. 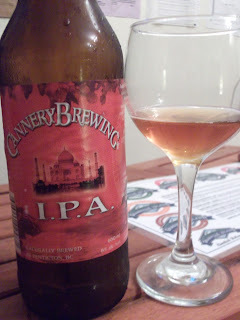 A quick note before we get going: this is a more beer-reviewy post than usual, so proceed accordingly. Starting with the lowest ABV beer, Blitzen kicked things off. More than just one of the antlered crew piloting Santa’s sleigh, it’s a spiced version of Fool’s Golden Ale. And not just spices going into the brew, but a corny keg stuffed with spices through which the beer was transferred into the brite tank. Blitzen is a more lightly flavored beer than I usually prefer but the spice nose start things off right and at less than 5% ABV, this would be a great beer to drink while making a holiday meal. Working ahead, I started reading the description for Brewdolph, “Belgian style red ale,” and I got excited. Then I got to “Ardennes.” I tried my best to keep an objective outlook when sampling it but the spicy/clove characteristics of this yeast strain have proven time and again that we just can’t be friends. It’s ok, there will be plenty of Belgian beer lovers that I think will thoroughly enjoy it. Keeping in mind I enjoyed two of the first three, I tried to stay cautiously optimistic as Holiday Cheer, a vanilla porter, was served. Vanilla is not an ingredient I’ve found to be successful in most beers but Irena was right that Zach had made good with this beer. 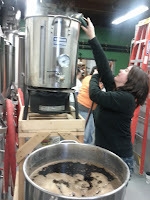 Black in color and aroma, the vanilla took a supporting role to the porter base. Tasty without being sweet or artificial tasting, I can only imagine this would be lovely on nitro (hint, hint!). After enjoying Holiday Cheer more than I had anticipated, I cautiously hoped for the best with Jolly Bock. I’ve told you before that I don’t like lagers (98% of them) and bocks are generally too sweet in the wrong way for me to enjoy. Well, once again I was proven wrong and reminded that even if it isn’t a style I generally like, it’s worth a try. Maybe it was the amount/type of hops or maybe it was the Munich malt, but whatever the “cause”, I found this to the first bock I’ve enjoyed. The final two beers, Old Tavern Rat and Bourbon Barrel Aged Old Tavern Rat, were also relatives with the “young’un” aged for only about a year while the BBA is approaching two years old. As expected Old Tavern Rat was light on the aroma and had the alcohol bite of a barleywine; there was no denying the 9.4% ABV. BBAOTR on the other hand brought back some very good memories of similar beers (including Rosie’s) and happy times drinking them. *The 10th beer, 8 Malty Nights, was still fermenting and won’t be available until the December 14th release. Canada makes some good beer, but unless Labatt’s is your idea of “good” beer, you’ll find it tough, if not impossible to get much of it in the U.S. In 2003 we spent part of our honeymoon in Victoria, B.C. and found some great brews. 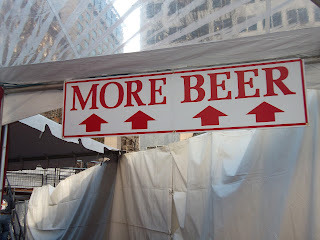 Then a few years ago we vacationed in Toronto and I found a new appreciation for lagers. Since then the extent of my Canadian beer drinking has been the occasional Unibroue, which while good, are hardly representative of Canadian beers in general. Last night we were invited to a friend’s house, a friend who very generously brought back a variety of bottles from his last visit to Vancouver, B.C. The majority were IPAs, which excited me. The majority were also marked, “strong,” which amused me. It appears that by Canadian standards a beer is “strong” when it’s over about 5.5 or 6% ABV. 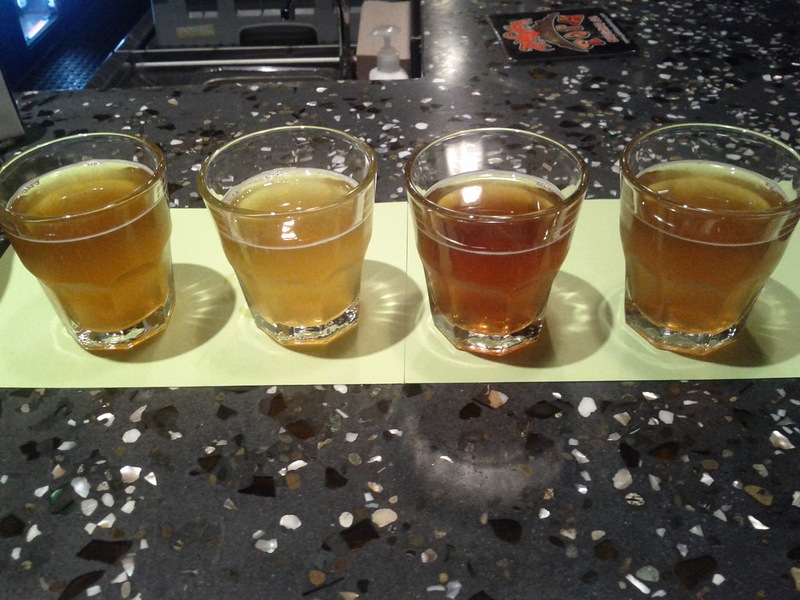 Of the nine beers we sampled I would be hard pressed to pick my favorite out of these four. Uncharted Belgian IPA from Lighthouse Brewing, this beer uses both Belgian and West Coast IPA yeast strains and was hands down the coolest artwork of the night. Fat Tug, Canada's Beer of the Year, from Driftwood Brewing is deserving of the title. As with that involves sharing beer with friends, it was a good one. And it reminded me that it might be about time to plan another trip. Sage, an herb I’ve come to really enjoy after growing a plant this year, managed to find its way into my mouth twice yesterday. Twice in very delicious, however very different ways. Hitting up a food cart pod for lunch before doing some beer shopping I couldn’t pass up a pork belly sandwich from Lardo. And I figured as long as I was in it that far, I might as well add on some of their Lardo fries (fried in actual pork fat), especially since they were offering them “dirty”: with pork bits and MamaLil’s peppers. When they came out not only were there pork and peppers, but also fried pieces of rosemary and yes, sage! I don’t know whose idea it was to fry up some sage leaves but not only did it keep them brilliantly green but really tasty. Fast forward a few hours to the Halloween party we attended. I knew ahead of time that there would be a keg of Blackberry Sage Porter brewed especially for the party from Short Snout Brewing, with the help of the evening’s host, Michael. Having been impressed by all of the Short Snout beers I’ve had to date, I was excited to try another one and one with an interesting combination of ingredients to boot. The beer was absolutely delicious and extremely sessionable. While a sage flavor didn’t stand out, it certainly served a supporting role, complimenting the blackberry. With any luck Short Snout’s Kickstarter campaign will be successful and more folks will get to try this amazing beer. Last night we did a very uncharacteristic thing for the McDs, we opted not to go to a beer fest, the Fresh Hop Tastival at Oaks Park. Instead we hit Fire on the Mountain for the most delicious wings on the planet and even though being stuffed, decided to stop by The Beermongers on the way home. It had been too long since our last visit but as always, we were welcomed back with open arms and a chalkboard full of interesting choices on tap. With it being fall, Mag ordered up an Oktoberfest from one of the newest Portland breweries, Occidental, and with me being me, I couldn’t pass up the black IPA. I am in agreement that they are not black IPAs, but CDAs, however that’s the official name of the beer. Beyond the pull of a black IPA/CDA, it was also from Uinta, which is a new-to-this-market brewery, out of Utah of all places. To date I’ve only Punk’n, and while it was fine, it didn’t knock my socks off. However, I’ve continued to hear good things about their other beers and I’m always interested to try something new. The imperial pint poured black as night and the aroma hinted strongly that I was going to be pleased with my selection. Taking my first drink, “pleased” was an understatement to the degree of saying bacon tastes fine. No, bacon is one of the most delicious foods and this beer, Dubhe (pronounced Doo-bee) Imperial Black IPA, is one of the most delicious black IPAs ever. 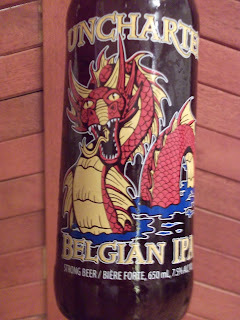 Not only does it offer the strong hop hit of an IPA, but it’s also a full bodied beer that coats the mouth and lingers. To get something this intense I would suspect there would be a corresponding sweetness that would make it difficult to get through. Not so. What made this pint last so long in front of me was that with each drink I savored it and enjoyed the aftertaste nearly as thoroughly. The cherry on top of it all was that not only did The Beermongers have this on tap, but in bottles, too! Of course I had to take a couple home with me and as I was preparing to write this morning, the thought did actually cross my mind to crack one open. It’s that good. October starts on Saturday and with October comes Halloween. In anticipation of the season New Old Lompoc will release this year’s version of Monster Mash on Friday. Last night I had the opportunity to preview it and sample six other beers. Those familiar with Monster Mash know that it’s a seasonal brew generally only available for a few weeks each year. Described as, “an Imperial Porter featuring strong chocolate and roast flavors with a touch of fruit,” this beer weighs in at a healthy 8.1% ABV. The oak notes are present in both the aroma and flavor and without the heavy sweetness often found in imperial brews, it’s a drinkable imperial. We were also treated to an aged Monster Mash, brewed in 2009 and bottled in 2010. I always enjoy side by side comparisons and found this one to offer greater berry/fruit aroma than the “fresh” version. As much as I enjoyed the two versions of Monster Mash, it was a couple of the other beers that stood out for me the most. The first was actually the first beer I had upon arriving, Steaming California. Anchor Steam produces the most recognizable steam beer but it’s not something I’ve ever been a fan of. NOL’s version, however, is clean and easy drinking. Maybe it’s the combination of Cascade and Cluster hops that I enjoy so much that overshadow the use of an American Pilsner yeast strain, something I would typically dislike. The second beer was again something I didn’t anticipate being a fan of. 2008 Mon Cheri, “a Belgian-style golden ale brewed in January 2008, featuring a mild fruitiness and a complex spicy character,” is probably one of the very few Belgian-style golden ales I’ve ever enjoyed. My first impression, the aroma, struck me as significantly more boozy than 6.4% ABV but it proved to be easy drinking and I’d agree with brewer Bryan Kielty that it has aged well. Both Flamingo, Condor Pale Ale barrel fermented with sour cherries, and Bierz Brown, a dark brown ale with a malty body and strong chocolate and roast flavors, weren’t quite there for me. I wanted Flamingo to be bigger, heavier and more full-bodied, but it is what it is, a pale ale of 5.2% ABV. Bierz Brown, the first brew by Irena Bierzynski, was poured off the brite tank and I found to be a bit thin in body. Those minor criticisms aside, neither was bad, and I suspect they will be enjoyed by many, just as I enjoyed the C-Note Imperial Pale Ale. Can’t go wrong with the seven “Cs” of the hop world and 100 IBUs! Thanks go out to the Lompoc Crew and Chris Crabb for an enjoyable tasting! 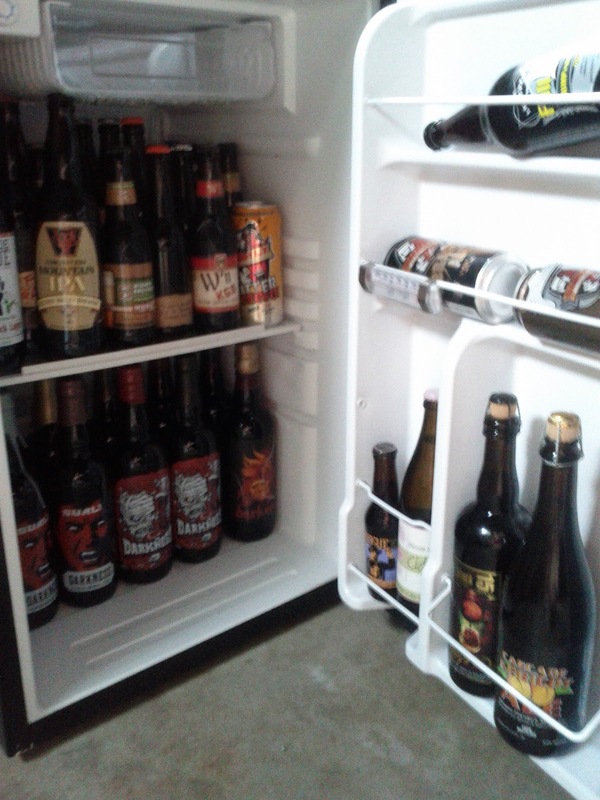 It's been a while since I've given you a look inside my beer fridge. If you remember the pre-move-to-Portland pictures, you'll see this is a considerable downsize. The top shelf and about half of the door are filled with Oregon beers: Rogue, Golden Valley, Full Sail, Widmer, Block 15 with the bottom shelf and some of the door filled with one of our Minnesota favorites, Surly. On Saturday one of our favorite haunts, Coalition Brewing, hosted “Mighty Mites: A session beer festival” on their back patio. This was the second such festival of the summer with Blitz Ladd putting on “Summer Session” the last Saturday of the July. We didn’t make it to that one, having out of town beer lovers and houseguests to tour around Beervana, and had it not been the case that my better half is a greater fan of session beers than I am, I might not have made it to this one either. Perusing the offerings as set up ran past the official noon start time*, I crossed off the beers I’d had before, setting my course to hit a couple lighter hopped beers before diving into ones I expected to have a bit more bite, like Stone Levitation. I also had to set Fort George Working Girl Porter back in line a few places, not wanting the anticipated chocolate/coffee flavors to coat my palate too early in the game. Throughout the afternoon, which was sunny, toasty and perfect for drinking session beers, I made it through all of the beers I wanted to try and then settled in for repeat fills of Block 15 Berliner Weiss. Not the most attractive of beers, especially through the cloudiness of my OBF mug, it more than made up for it with a light and mildly tart/sour flavor that cut through the heat of the day. Besides the beer and the great weather, there was plenty of beer talk to be had. 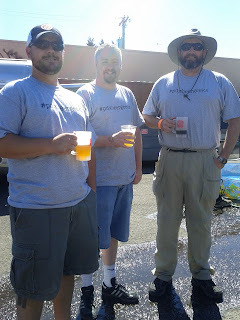 A number of the #pdxbeergeeks showed up, we reconnected with some folks we had met at another fest and got the chance to talk to a few new acquaintances as well. Not much more one could ask for, if you ask me. 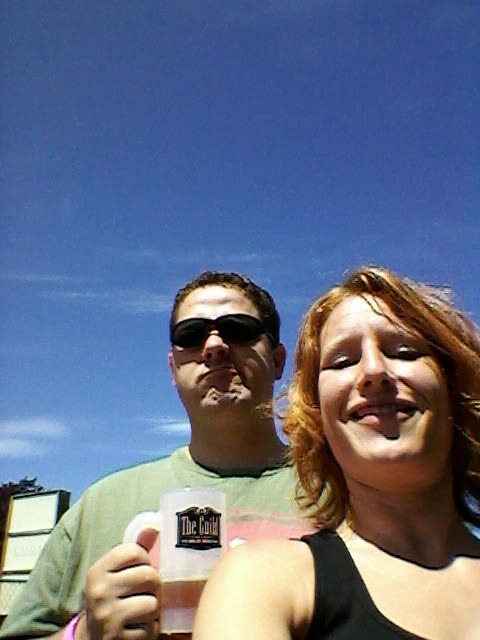 *I have come to the conclusion that it must be a rule for all Oregon beer festivals to start late. Therefore no offense aimed in any specific direction. I did it. Finally. On a Monday night no less. That’s right, I’m no longer a Roscoe’s virgin. What pushed me over the edge? What temptation was it I could no longer resist? Sushi. Not just any sushi, but sushi paired with the bittered nectar of the gods, beer. 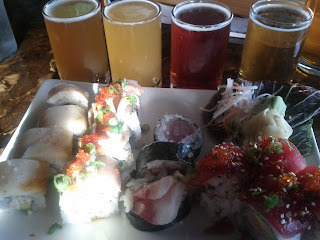 Although my love of sushi is strong and my love of beer uncontested, combining the two in a planned way was something I found to be intimidating. If done improperly, instead of complimenting one another one might overpower the other or they might clash in a horrific way. I’d be left unsatisfied and resentful of squandering two things that are exquisite on their own. 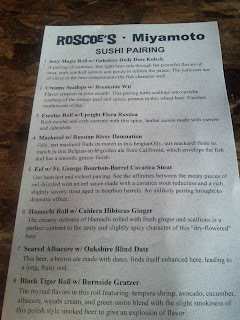 Of the eight pairings Roscoe’s, and their neighbor Miyamoto Sushi, offered, four passed my lips. Those four were chosen based more so on the sushi side of the equation, with the beer pairing barely taken into consideration. In fact it’s unlikely that I would order a pint of any of these four beers on their own. Both the Gratzer and the Flora Rustica and not styles I tend to prefer, Kolsches don’t generally do much for me and the Hibiscus Ginger, while intriguing, would get the most cred in my book by the fact that Caldera makes it. If you weren’t able to make it to this event, I’m sorry. It was a great time and at only $15 for all of that food and beer you see in the picture, an absolute steal. But don’t be too sad. Miyamoto sushi can be ordered and eaten along with beer at Roscoe’s any evening until 1 am. And keep your eyes open for me because this first visit is the kind of visit that ensures I’ll be making my way back for more. A big thanks to all the folks that worked hard and worked together to put this on. You did great! 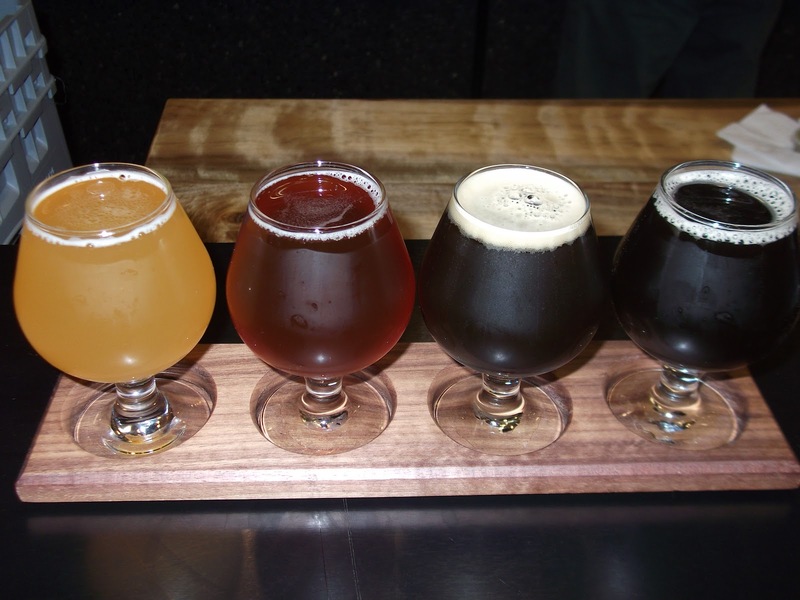 Warning: This post is only sort of about beer. It’s more about beer people. Having not posted for a few weeks I’ve been feeling a little stressed, like I’m letting the handful of loyal readers who bother to keep coming back down. I’ve been drinking good beer as usual but nothing has inspired me quite enough to tell you about it. But a beer related musing has popped into my mind, triggered in part by meeting up with some #pdxbeergeeks at the Green Dragon earlier this week. I’d met a couple of these people, who I’ve found through the Twitterverse, in person before. The rest however I’d just seen through whatever picture they’d chosen to represent themselves with. Many of those pictures, including mine, obscure part of the face so one only has a partial idea of what the person looks like. This leaves one’s mind to make up the rest and it’s unlikely that the mind will get it exactly (or even remotely) right. I was told by one person (not last night) that I look taller in my Twitter picture. When I heard that I thought it was kind of odd but since then that exact thought has popped into my mind about someone else. Weird. I don’t have an explanation so if you do, I’d love to hear it. Anyway, I find it interesting to see what picture people chose to represent themselves with after I’ve met them in the flesh. I know many of mine have as much to do with how I look in the picture as what was actually going on when the picture was taken. I have a pretty solid ritual when it comes to writing about a beer fest: grab my notes (for memory assistance on my favorites), grab a copy of the program (for the full names of the beers and their corresponding breweries) and plug in the camera (for things I may have forgotten but seemed worth taking a picture of at the time). This year I just sat down and knew, for the first time, there were two clear, stand-out winners in my mind at the Oregon Brewers Festival. This excludes any Buzz Tent beers, but I’ll get around to more about that in a little bit. It seemed there were quite a few more fruit beers at the festival this year but as is often the case, particularly with fruit beers, there’s a wide range in how well they’re made. This beer was chock full of fruit flavor, nothing artificial, sported a beautiful color and hit that just right balance of sweet and tart. This is one of those love it or hate it beers and in all honesty, when I decided to get a sample of it I didn’t think I was going to like it. Oh, how wrong I was. Besides the pleasing combination of flavors, it was the incredible mouthfeel that hooked me. Not many beers have that silky, velvet-in-the-mouth quality so when I find one that does it’s memorable. Finally, this had to be the best deal of the festival, 10% ABV and not in the Buzz Tent. 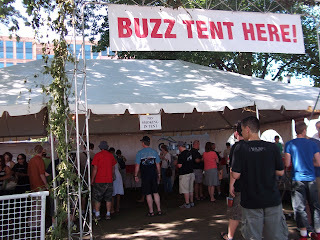 There was no listing of the tapping order of the Buzz Tent beers. Clearly it’s impossible to assign a day and time to these beers but having the knowledge of whether the beer I’m hoping to try is five keg or 15 kegs away from being tapped is very useful. 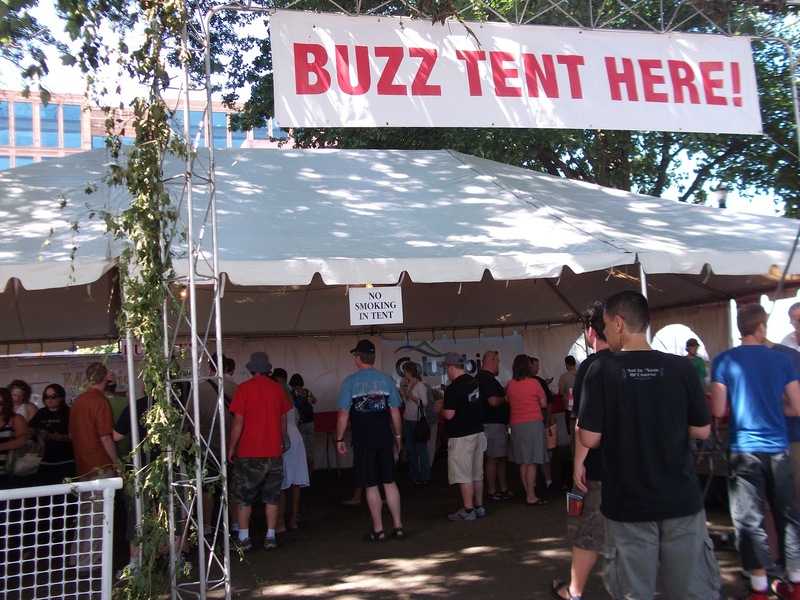 The use of the Buzz Tent Twitter account was nearly non-existent (until the late Friday night tweet saying that everything had been blown). Last year’s announcements, along with the tapping order list made it very easy to figure out if I needed to make a run to the fest to get some object of my desire. 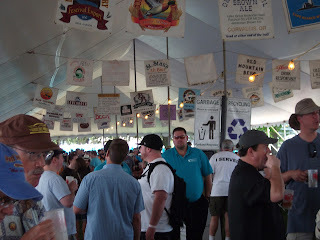 The overall poor organization and signage in the Buzz Tent was surprising and disappointing. 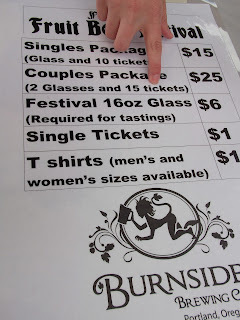 We were there at the beginning of the festival on Thursday and they weren’t even close to being ready to serve beers. When they were finally ready, the signage was so poorly hung that getting in the right line was difficult. Beyond that, at least one of the (hand written) signs was blatantly wrong. The name of the beer, which described the ingredients, was correct in the program, correct in one of the few tweets that was sent out and it was something I’d had at the brewery the day before. Yet the sign in the tent was wrong. Although the disappointments of the Buzz Tent are something that the organizers need to take a long, hard look at, overall, I still enjoyed the festival and am sure I’ll be returning next year. Thanks go out to festival organizer Chris Crabb for contacting me about a media pass and providing me with a mug and a portion of the tokens that fueled my OBF adventure. With sour beers being my most recent infatuation I thought I would be more excited by the weeklong Puckerfest at Belmont Station and more motivated to get over there, ensuring I was able to try as many of sour beers they planned to have on tap as I could. The first day of Puckerfest was a Monday, the day of the week I’m least likely to make it anywhere. I was seriously jealous reading about the great sour beers people in my Twitterverse were trying. The same was true for the next couple of nights but my envy also came to be tempered by the “too many beer events going on that I just have to accept I’m not going to make it to all of them” understanding that has become part of my life since moving here. Then Friday afternoon the opportunity to swing by Belmont Station presented itself. I almost didn’t stop, having just left the Cheese Bar after a delicious lunch with friends and being on my way home where there were things awaiting my attention. As it happened, my path took me directly by Belmont Station. Had I been a couple blocks north or south I probably would haven’t stopped but I figured it wouldn’t be right NOT to stop in since I was driving directly by it. Once inside I think I probably spent a good five minutes deciding what to order. I had decided that I’d only order two of the smallest size so making the “right” ordering decision was critical. I finally narrowed it down to Block 15 Ferme de La Ville 2011, primarily because it was one of the offerings with Brett in it, and was debating my second selection when I heard a couple people at the bar raving about Walking Man Foot Funk. I had considered this beer, but in all honesty, it was the name that was turning me off as I find feet to be repulsive but I decided to put it out of my mind and go with the overheard recommendation. The Ferme de La Ville was good, slightly dry and exceptionally drinkable, a great beer for the gorgeous, warm, sunny afternoon. But as soon as I had my first sip of Foot Funk I was in love. 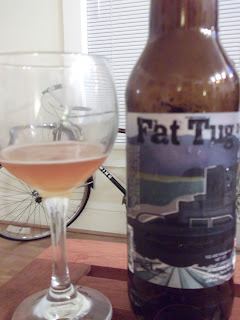 Tart, sour, a little funky, it was so good I don’t think I can even convey its awesomeness. And if you had walked by the table I was sitting at you probably would have wondered what was wrong with the short redhead with the stupid smile and slightly glazed look on her face. It’s unlikely I’ll be able to make it back before Puckerfest is over. That means I’ll probably miss at least two or three other sours beers that would knock my socks off and many more I’d enjoy. But I’m ok with that because those three or four ounces of Foot Funk were that good. At most beer festivals you’ll find the beer being poured out of kegs, firkins and the occasional bottle. At the first ever Cans Fest, from Jesse Cornett and The Guild Pub, there was none of that (almost none, but we’ll get to that a bit later). Prior to the event, I went about my usual beer geek ways and poured over the final line-up of beers. I counted a total of 35 beers and to the best of my memory 11 of them were ones that I had never tasted or I didn’t recall seeing available for purchase at The Beermongers, Belmont Station and the like. My plan of attack, and subsequent “listing”, was to focus on the latter and if I had the time, energy or sobriety I would move on to some of the rest. Overall, none of the beers blew me away. However that’s not to say that I didn’t enjoy the fest. It was great to try a bunch of new-to-me beers and it’s exciting to see more and more breweries embracing the canning of beer. 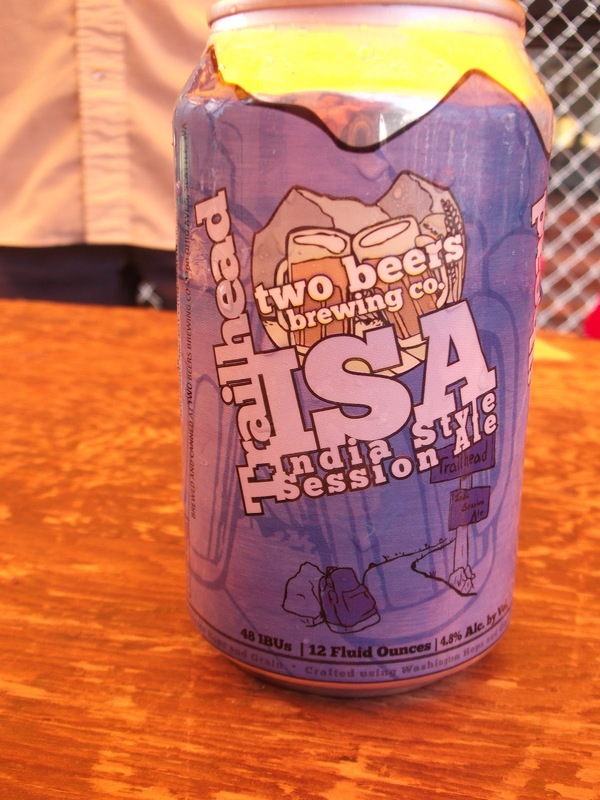 My favorite beer, Trailhead from Two Beers out of Seattle, WA, was a style I had not seen before, India-style Session Ale. 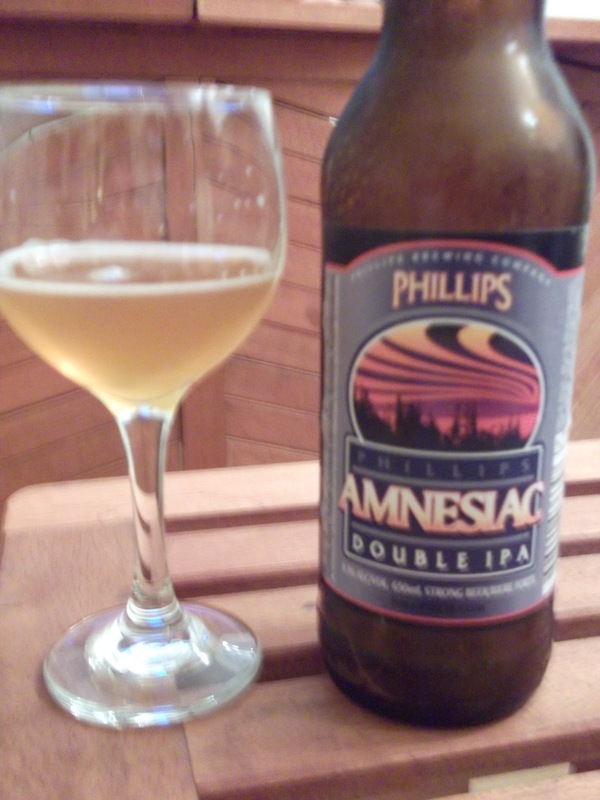 It combined a slight sweetness and maltiness with just enough hops to tickle my tastebuds. Probably my favorite part of the fest though was something I didn’t even know about until I got there: a side-by-side keg vs can taste test. 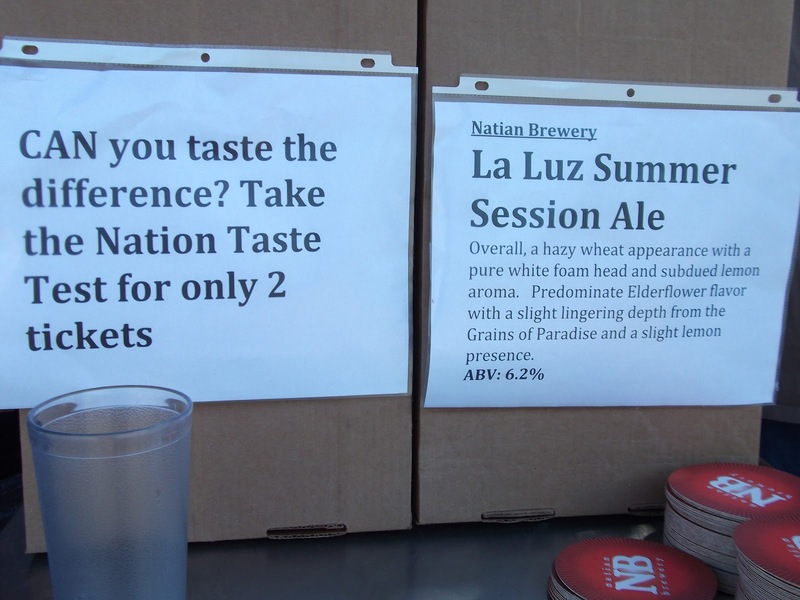 Put on by one of Portland’s own nano-breweries, Natian, they were offering their La Luz Summer Session Ale, poured by a new Twitter acquaintance, Emily. Mag and I made opposite guesses (as it turned out my guess was correct). There weren’t huge differences but certainly enough to back up thoughts I’d had in the past, either, “Gosh, this tastes better than I remember when I had it on tap,” or visa versa. Like many first time festivals, there is probably a laundry list of things the organizers will improve upon or do differently next year. I’m happy to say though that from an attendee perspective, for the first time out of the gate, it was a good showing. I look forward to, and hope there will be, the Second Annual Cans Fest next year. Finally, a thanks to Ryan and The Guild for finding me and awarding me one of the VIP tickets. For those of you who don’t live in Oregon, or just crawled out from under your Oregon based rock, July is Oregon Craft Beer Month. The start of the month was also nearly the start of our cabin stay for the 4th of July weekend meaning what I’d be drinking for the first few days would be what I brought along since having the furry child in tow squashes any plans of checking out local joints. As it turned out, the beer we ended up acquiring was indeed Oregon made: Full Sail IPA (Trader Joe’s carried it and I was already there) and Rogue Ditoir Black Lager and XS Imperial YSB (we hit the Green Dragon garage sale before heading out of town). Happily we both agreed the IPA had just the right combination of flavors that this could become a staple in our house. And for me, I could forget the fact that the Rogue was a lager and concentrate on its close resemblance to the much loved CDA-style brews. Finally, the YSB was not only tasty but came in the cute little bottles I first became acquainted with back in my early craft beer days when I’d buy Little Kings frequently. 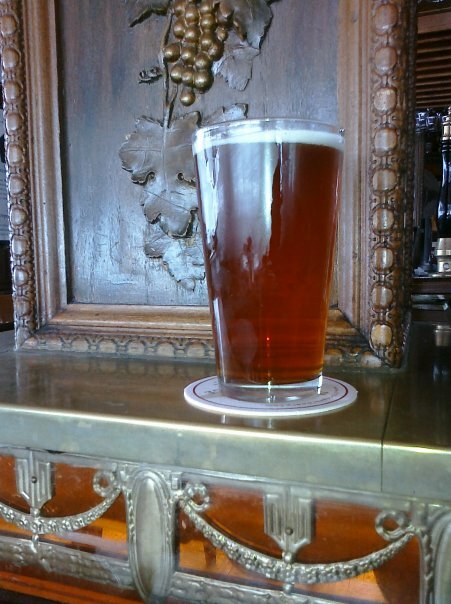 People have different personal goals for the month: some to drink only Oregon beers, some to drink new-to-them Oregon beers, some to visit Oregon breweries. As much as I love my new state and the many fine brews made here I’m quite the whore when it comes to craft beer in general. I’m up for trying anything new, shiny, weird or otherwise. So I think the best I can ascribe to is that any day I’m drinking beer, I’ll have at least one Oregon brewed beer. So here’s Oregon Craft Beer! Drink, enjoy and remember if you’re not here you’re welcome to play along at home. Friday, the end of the week/start of the weekend, was a good one for multiple reasons, one of them being a completely unplanned opportunity to try a beer I’d read about earlier in the day but had written off due to previous plans. In a double beer tweet, Amnesia proclaimed, “Tappin’ it! Dopacetic, our double version of Copacetic IPA, goes on tap today along with Plum Founded, beer made with Italian plums!” Now I know you might not believe me, the hop head, when I say this but I was actually much more drawn to the latter offering. As intrigued as I was I figured a visit wasn’t in the cards for Friday night, maybe not for the whole weekend, so it would likely be gone before I got up there. Oh well, another beer I’d have to just wonder about. But then, the afternoon took a turn with the combination of getting all my stuff done early for the evening and finding out some friends were meeting at Amnesia for beers. There wasn’t a huge window in my schedule, but enough I figured for a beer or two so I gathered up my goods, packed the cooler and hit the road. It wasn’t until I got to Amnesia, said a quick hello to the group and was perusing the beer menu did I realize I was going to get to try Plum Founded. Joy! In all fairness I have to admit that if I didn’t know there were plums in the beer there would be a good chance I couldn’t properly identify the flavor. It’s a good flavor, don’t get me wrong, and it works very well with the Alt base, it’s just that plums don’t have an assertive flavor. Oh yeah, and I’m pretty sure this is the first plum beer I’ve ever had. I assume this is a seasonal beer, maybe even a one off beer, but it’s one I’d love to see being brewed with regularity. Maybe it’ll make a return appearance at next year’s Fruit Beer Fest. In the meantime, any other chances that present themselves for me to drink it I’ll happily take. Beer drinkers, bear with me. 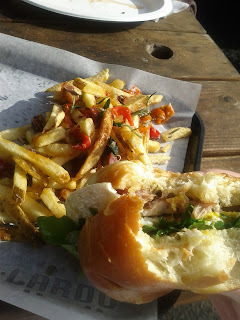 I know the start of this post will come off very food-centric but I promise I’ll get around to talking about beer. Today I was checking in on some of the food blogs I enjoy and once again marveling at the freewheeling use of cream (which could be replaced with butter/cheese/fat-of-any-sort-that-is-oh-so-delicious) in a recipe. Reading it I was thinking, “How do these people do it without becoming blimps, as I would?” Then it occurred to me that maybe they just use their calories differently, for example towards cream where I happily allocate them towards beer. Many of said blogs are based back in Minnesota, where recycling is different than here in Portland. Where we lived in Eagan we had a huge, lidded bin where all the recyclables got comingled. In Portland, comingling is allowed, with the exception of glass, which generally is put in those plastic, slightly-larger-than-a-ream-of-paper sized boxes and set out on the curb with the rest of the containers. In this manner, as I’ve been walking the dog in the morning on trash days, I’ve noticed what seems to be quite a lot of alcohol bottles. Not hard alcohol, mind you, but beer and wine. In fact, had I kept count I think the number of wine bottles would far outweigh the beer bottles, even taking into consideration their generally larger size. So here’s what I wonder: Do people out here really drink that much more than back in Minnesota? Or is it the case that the “evidence” is just more obvious here? While I don’t expect to find an answer I would be interested to know what you think. Can, Can: Can I Get a Can? 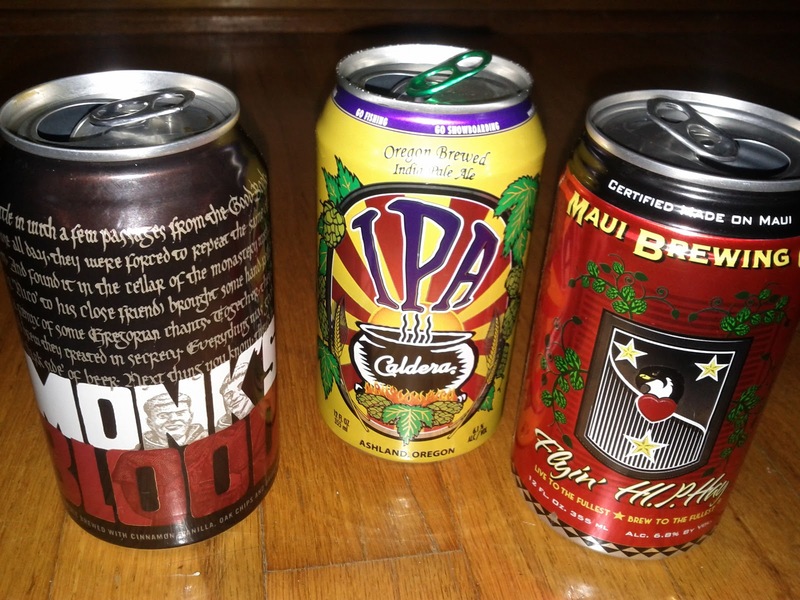 It was by no means planned but last night’s drinking ended up consisting entirely of canned beer. The first one was an unusual choice for me as well as for the beautiful, sunny, warm afternoon that was yesterday. The can of Monk’s Blood from 21st Amendment caught my eye while I was at Saraveza purchasing my Illegal Beer Bus ticket. It’s an unusual choice in that I pretty much feel the same way about 21st Amendment as I do about New Belgium. Hell or High Watermelon receives the same hype and adoration as does Fat Tire. Granted, this comes from people who find it important to be drinking “cool” beer. Nevertheless it tends to turn me off from their products in general. It’s been a while since I had my last Monk’s Blood and after giving it another try, I will have to try to ignore the fact that 21st Amendment makes it. Instead I need to remember that it’s a solid beer, albeit probably more suited to a cool day, and like New Belgium, 21st Amendment can make a good beer. The next one, Flyin’ HI.P.Hay from Maui Brewing, was also a bit of a second chance selection. I wasn’t thrilled with this beer the last (and first) time I had it. Part of it was that when I cracked it open I was in the mood for a nice, hoppy IPA and this beer is not that. This time around I knew I was getting an IPA with some characteristics of a red. With the resetting of my expectations I quite enjoyed this beer. As a bonus it went nicely with my cigar. To end out the can session I went for a beer I knew, and knew would hit my hop spot – Caldera IPA. It’s a solid, straightforward IPA. Weighing in at 94 IBUs this is a sure winner for me any day. I love that so many breweries are using the can as their method of getting their beer into my house. But being the equal opportunity drinker I am, put it in a can, put it in a bottle, just make a good beer and I’ll put it in my fridge. Yesterday was the first ever Portland Fruit Beer Festival, the brainchild of Ezra, who seems to have his fingers in darn near everything related to craft beer in Portland. While his full bio and exactly how he got his great gig are things I don’t know, what I do know is that his experience and connections means he can put on one heck of a festival. I won’t go into all the details, you can find that on their Facebook page or at Burnside Brewing’s website (the fest was held in their parking lot), the bones of it are that there were about 15 “regular” beers and an additional 15 that were considered “special”, with two on tap at a time, being replaced with another one as the keg blew. Before I get into the beers themselves, you should know that this was a fruit beer fest, not a girly beer fest. Sure, the more beer-timid drinker was probably able to find enough approachable beers to say they enjoyed their time. However, to be able to fully appreciate and enjoy the offerings, you’ll need to be going further afield than Leine’s Berry Weiss or Sam Adam’s Cherry Wheat as many of these beers had sour or Belgian characteristics. Enough chatter, let’s get to the part you care about, the beer. Of the 15 regular beers I had all but one, Dogfish Head Festina Peche, not because I wasn’t interested, but rather because it’s a beer I really like but know I can get just about anytime I want it. As for the special beers, there were only three available during the time we were there and I tried all three. New Belgium Ooh La La – It’s hard for me to say it, being that I think New Belgium is a bit over rated in general, but this just goes to show that they can make a really exceptional beer. Raspberries were used here and it was the beer that had the most fruit flavor, almost like drinking a glass of perfectly ripe raspberries, except there’s the added fun of 8.5% ABV. Beetje Zure Kreten – One of Portland’s nano-breweries, this beer was just about the polar opposite of Ooh La La. Instead of the fruit (currants) standing out, the beer exuded the cheese stank I love. Burnside Gooseberry Berliner-Weisse AND Marionberry Berliner-Weisse – The former was part of the regular beer selection and extremely refreshing, something that would hit the spot on a hot, humid day. 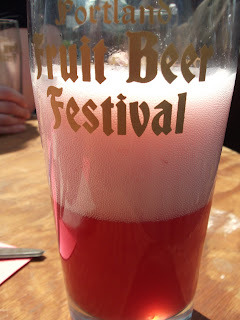 The latter was one of the special beers and extremely fruity, with fruit particles floating in it, giving it the look of a glass of freshly squeezed ruby red grapefruit juice. 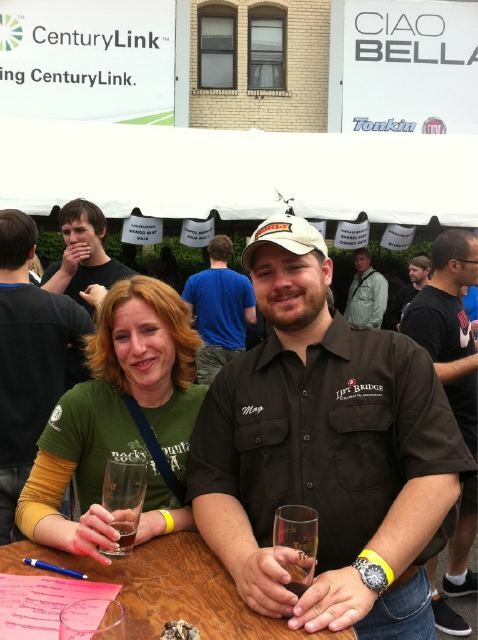 This is a two-day festival so there is the opportunity for us to make a return visit today, to try some of the special beers that are available and have some of our favorite regular beers (unless the kegs have blown, in which case there may be some replacement beers that weren’t available yesterday). I don’t know if we’ll make it or not but if we do, I expect another knock-it-out-of-the-ballpark experience. Thanks to Michael for the pic! 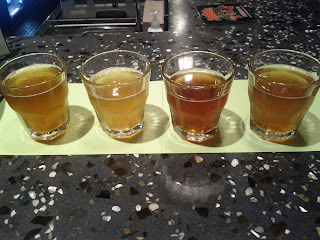 *Update: We did go back for round two on Sunday, but there weren't any beers that eclipsed what I tasted on Saturday and for the most part I kept going back to the well of two "runner up" beers: Block 15 Psidium and Widmer Himbeere Gose.